Brooke Gabrielle Fraser (born December 15th, 1983 in Wellington , New Zealand) is an award-winning New Zealand singer/songwriter. She grew up in Naenae, Lower Hutt and attended Dyer Street School then Naenae Intermediate and Naenae College. Brooke started taking piano lessons at age 7 - she continued to take these until she was 17. She started writing songs at age 12 and taught herself the acoustic guitar at 16. She debuted in her native New Zealand five years ago as a 19-year-old singer/songwriter with an album, What To Do With Daylight, that catapulted her into the charts with four number one radio hits and sales exceeding seven times platinum. 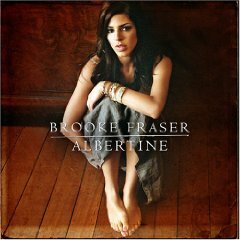 Fraser followed that with Albertine, a sophomore album that showcases her songwriting maturity and continued appeal to her homeland audience as well as being her first North American release, coming out in May 2008 on the Wood & Bone label (Redeye). Albertine has already earned Brooke five times platinum sales in New Zealand, given her a top 20 chart placing in Australia, and New Zealand’s coveted Silver Scroll Award for songwriting as well as serving up more radio smashes in the form of airplay number ones “Deciphering Me” and “Shadowfeet." 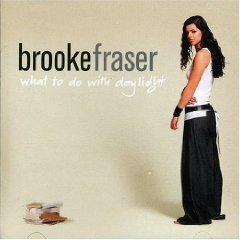 Brooke's first single Better exploded onto the music charts, peaking at #3 with her second single "Lifeline" looking likely to do the same. She spent the summer of 2008 touring extensively through the States and Canada with her band. Her musical influences range from soulful crooners Marvin Gaye and James Taylor to new millennium artists including John Mayer and India Arie. Brooke is the eldest of the three children born to former All Black Bernie Fraser and his wife Lynda.